Robinson Redwing - двухместный биплан с размещением членов экипажа бок о бок. Прототип построен "Robinson Aircraft Company Ltd" из Суррея, позже преобразованной в "Redwing Aircraft Ltd". Первый полет Redwing I выполнил в 1930 году с 4-цилиндровым ДальшеMore>>> мотором A.B.C. Hornet мощностью 75 л.с. Прототип Redwing II поднялся в воздух в октябре 1930 года с мотором воздушного охлаждения Armstrong Siddeley Genet IIA, за ним последовало девять серийных самолетов. Финальным вариантом стал единственный построенный Redwing III с крылом меньшего размаха и закрытыми обтекателями колесами шасси. Позже его доработали до стандарта Redwing II. Размах крыла самолета Redwing II - 9,30 м, мощность ПД Genet IIА - 80 л. с., максимальная скорость составляла 153 км/ч. ON Thursday of last week, June 19, Air Vice-Marshal Sir Sefton Brancker, Director of Civil Aviation, christened the first machine to be designed and built by the Robinson Aircraft Co., Ltd., of Stafford Road, Wallington, Surrey. 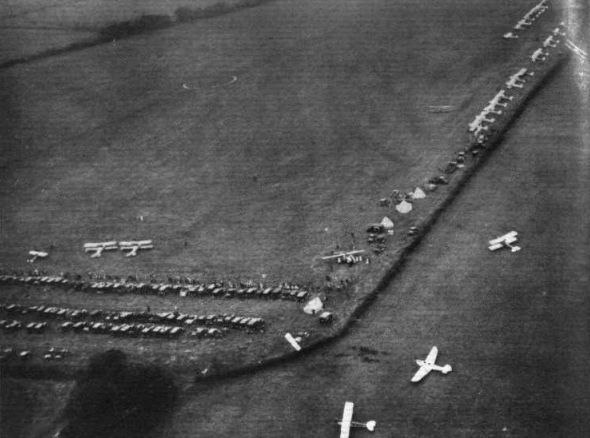 A number of invited guests were present at the little ceremony, which took place at the London Terminal Aerodrome, Croydon. Sir Sefton said he always welcomed competition because keen competition meant progress and progress was needed in order to hold our own against the aircraft constructors of other countries. He was, therefore, very glad to see the enterprise shown by Mr. Robinson and those associated with him in coming into the British light 'plane market, and if appearances were any criterion the new machine should do well, as the lines were, he thought they would agree, very beautiful indeed. He wished the new firm success, and christened the machine by stripping off a square of fabric disclosing the name "Redwing." 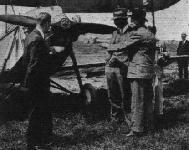 The machine was then demonstrated by Ft.-Lt. S. F. Woods, who did several loops and other evolutions. The takeoff was extraordinarily good, the "Redwing" leaping off the ground after a very short run and maintaining an excellent angle of climb after once leaving the ground. 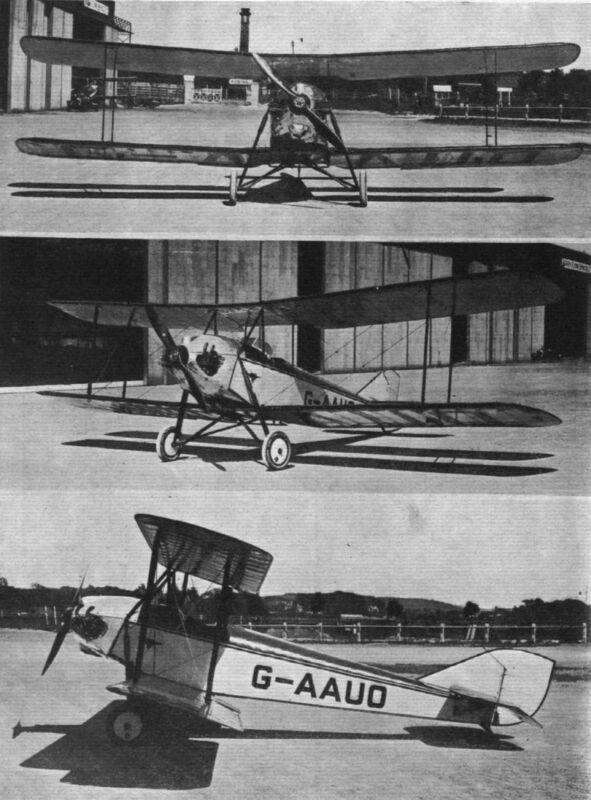 The Robinson "Redwing," the first photographs of which were published in our issue of June 13, is a side-by-side two-seater fitted with an A.B.C. " Hornet " engine of 80 h.p. 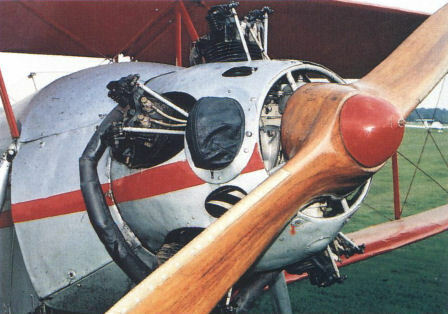 This engine, it will be recollected, is a four-cylinder air-cooled, double flat-twin, and in the Robinson "Redwing" a very neat cowling has been designed for it, which encloses and fairs the engine very cleverly, yet leaves the cylinder heads exposed not only for cooling but for any attention that may be required by valves, plugs, etc., without disturbing the cowling. The machine was designed by Mr. John Kenworthy who, it may be recollected, was responsible for the first post-war British light 'plane, the Austin "Whippet." That Mr. Kenworthy should now return to the fray as the designer of a modern light 'plane is a fact to be welcomed. 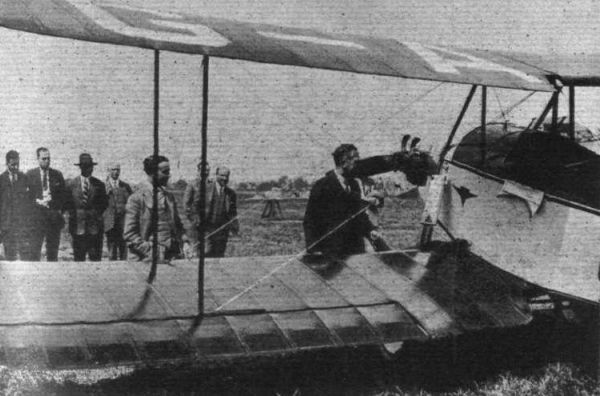 His “Whippet'' was a good little machine, but it suffered from two drawbacks: No engine of the quality of modern light 'plane engines was available at that time, and the "Whippet" was before its time. The "Redwing" has been designed not with a very high top speed in view but rather has the designer aimed at a machine with a very low landing speed, to be controllable at and near the stall, and to be very easy to fly. How far he has succeeded cannot be definitely known until the machine has passed its type tests at Martlesham and has seen a deal of service in the hands of the average owner-pilot. The three pilots who have flown the machine hitherto report that it handles very nicely and has no pronounced vices of any sort, so that it would seem that the "Redwing" starts its career very well. The first machine is of simple wood construction, and the first production batch, work on which has now begun, will be of similar construction. But the design has been so planned that, should it later be thought advisable to turn over to all-metal construction, the change can be made without affecting the design to any appreciable extent. 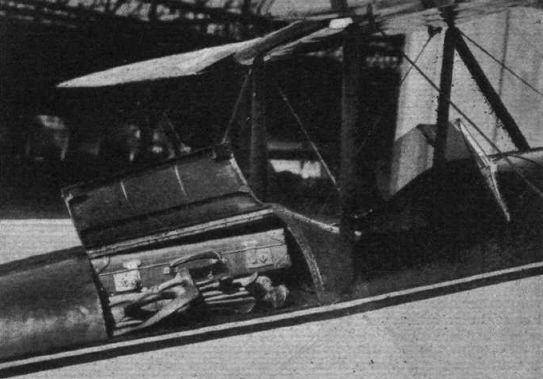 The side-by-side seating arrangement, although the fuselage is by no means a very wide one, is quite comfortable, and if the machine is to be used for instructional work a duplicate set of controls can be fitted. For ordinary touring the side-by-side arrangement should enable the occupants to talk in reasonable comfort without the use of telephones, at any rate when the engine is throttled to cruising speed. A result of the side-by-side placing of the seats has been that but a single instrument board (Smith's) serves both occupants equally well. The luggage locker behind the cockpit is of large dimensions, and is provided with a rearward extension for the purpose of accommodating long articles such as golf clubs, etc. This feature is shown in one of our photographs. An undercarriage of wide track is fitted, and the compression struts incorporate "double-acting" oleo legs, designed to give ample shock-absorbing qualities without bouncing. The wings are designed to fold, and the machine then takes up a space of but 10 ft. in width and 23 ft. in length. 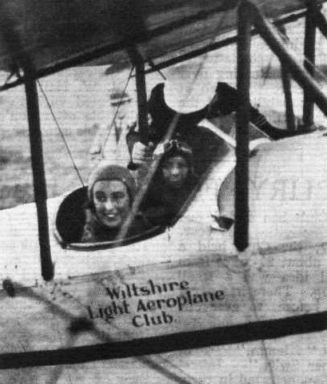 The standard equipment includes the following items: Two safety belts, pneumatic cushions for the seats, two suitcases fitted in locker, ladies' companion, large map locker, and two small lockers in dashboard, Tecalemit grease gun for control system, floor mat, engine tool kit, aircraft and engine log books, picketing rings, "Ki-gass" primer, long exhaust pipes, Splintex safety glass, red and cream colour scheme. With this equipment the price has been provisionally fixed at ?575. The tare weight of the "Redwing" is 800 lb., and gross weight for normal C. of A. is 1,325 lb., and for the aerobatic CofA. it is 1,150 lb. The main dimensions of the "Redwing" are as follows: Length, 22 ft. 3 in. ; span, 30 ft. 6 in; width, folded, 9 ft. 8 in. Official performance figures are not available until the machine has been through the Martlesham tests, but it is estimated that the top speed will be 92 m.p.h., the cruising speed 84 m.p.h., and the landing speed 30 m.p.h., while the climb to 1000 ft. should be accomplished in about 1 1/2 mins. 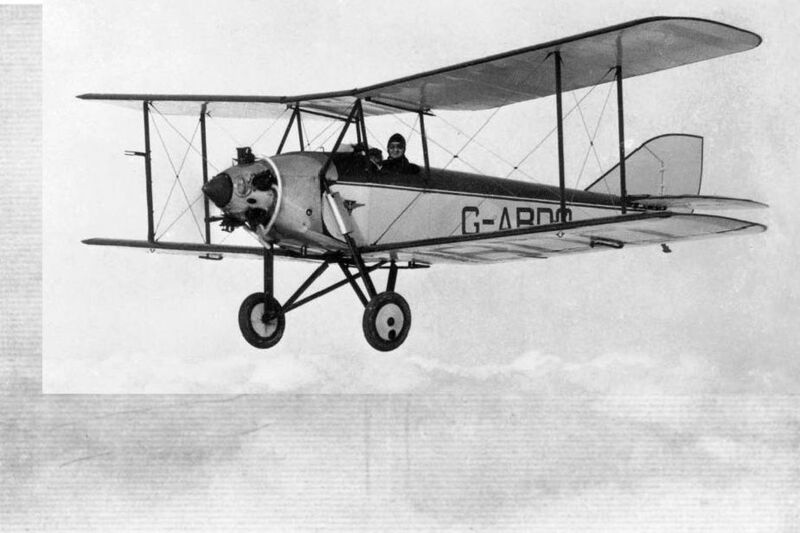 DESIGNED by Mr. John Kenworthy and built by the Robinson Aircraft Co., Ltd., of Stafford Road, Croydon, Surrey, the "Redwing II" follows very closely the lines of the prototype "Redwing I," but minor improvements have been made here and there where experience with the first machine indicated such changes to be desirable. It may, in fact, be taken for granted that such little snags as were found in the first machine have been entirely avoided in the second, which is the actual production type, and a batch of which are now in course of construction at the new works which the Robinson company has established at Waddon. Simplicity, robustness, and ease of handling were the aims of Mr. Kenworthy in designing the "Redwing," and it was desired to use the side-by-side seating arrangement in order that the occupants might be able to converse without the use of telephones, while if the machine was to be used for school work, the side-by-side arrangement would enable the pupil to follow closely exactly what the instructor was doing, and conversely, when the pupil took charge, the instructor could watch him closely and correct faults at an early stage, before the initial faults became fixed habits. It is by no means an easy matter to design a fuselage for side-by-side seating without making it of unsightly width, unpleasing to the eye, and inferior in the matter of aerodynamic efficiency. Mr. Kenworthy has certainly succeeded in at least the first of these two difficult problems. In spite of its side-by-side seating, the "Redwing" does not look particularly portly, and in fact, the lines of the whole machine are very pleasing to the eye. That Mr. Kenworthy has entirely succeeded in the second respect is, perhaps, open to doubt. Given equal drag coefficients, the fuselage with the greater cross-section must necessarily have a higher drag; but in the "Redwing" it would seem that quite a good deal of the extra drag due to width has been regained by taking care over the form of the fuselage. In any case, the fact with the "Genet" engine, appears to indicate that the aerodynamic efficiency, although not quite as high as could be achieved in a carefully designed tandem-seated type, is certainly not so low as to make any practical difference to the utility of the machine. 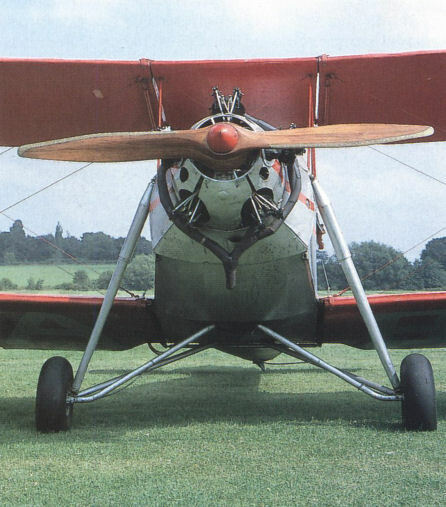 The "Redwing II" is, in its general design, a small single-bay biplane of orthodox layout, with a "Genet" engine mounted in the nose of the fuselage, a "split" undercarriage, and the two seats placed side by side but slightly staggered. The absence of a petrol tank in the top centre-section improves the appearance and probably reduces the drag a little. As a type the machine is unremarkable, but in its constructional details there is much of interest, and many features which reveal the hand of an experienced designer, as one would naturally expect from a man who has been intimately connected with the design side of aircraft since the early days. 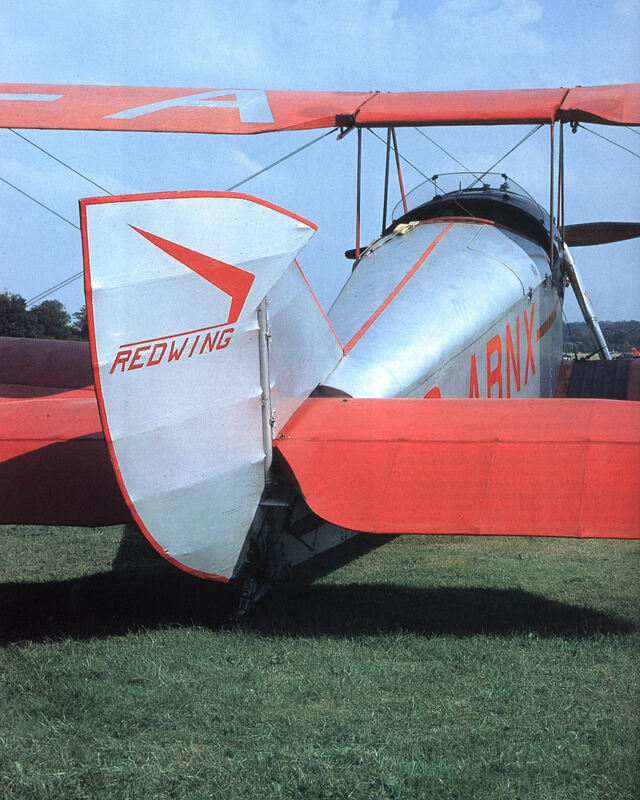 The fuselage of the "Redwing" is a flat-sided box with cambered deck. It is built up of a framework covered with plywood. The sides as well as the deck and floor have struts at right angles to the longerons, and diagonal struts across each bay. The side panels are staggered in relation to those of top and bottom so as to provide room on the longerons for the square three-ply "biscuits" used for attaching the struts to the longerons. One of our sketches shows the type of construction. An unusual feature is the omission of the three-ply covering from the bottom of the rear portion of the fuselage. Instead of the three-ply wood, fabric is used here, so that if at any time after prolonged use it should be desired to inspect the fuselage structure thoroughly, this is readily done by stripping off the fabric covering of the bottom. In shape the fuselage is of good streamline form, and in spite of the side-by-side seating, the width does not appear excessive. In the forward portion of the fuselage the construction is slightly different, due chiefly to the use of tubular cross-members to take the loads of the lower wing spars. These cross-tubes are carried in bearings formed by sheet-steel plates bolted to the lower longerons, and to prevent the securing bolts from gradually working loose in the wood of the longerons, thick aluminium washers are recessed into the longerons to give large bearing area. The two seats are placed side by side, but slightly staggered in relation to each other, the port seat being a little ahead of the starboard. Between the seats there is a triangular structural member formed by a vertical, a horizontal, and a diagonal strut member, the sides of all three being covered with plywood boards to form a triangular partition. 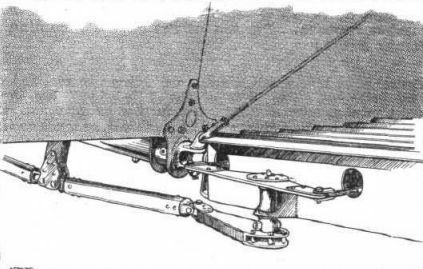 The horizontal member of this partition joins front and rear spar cross-tubes, while the upper end of the vertical member is attached to a cross strut in the deck. The object of this triangular partition is to form a stiffening member for the centres of the cross-tubes. The special bracing of these is made necessary partly by the extra width of the fuselage and partly by the undercarriage design adopted, in which the bent axles and the radius rods are hinged to the centre of the fuselage floor. 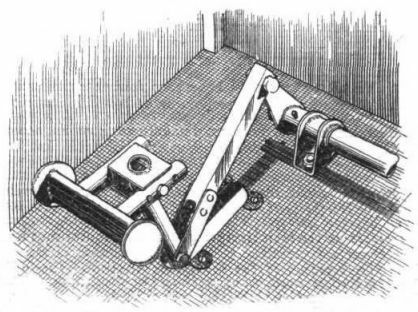 The manner in which the hinge for the bent axles is formed is shown in a sketch. The hinge for the radius rods is very similar. The horizontal components in axles and radius rods under load would produce bending in the cross-tubes, and this is taken care of by the triangular partition previously referred to. 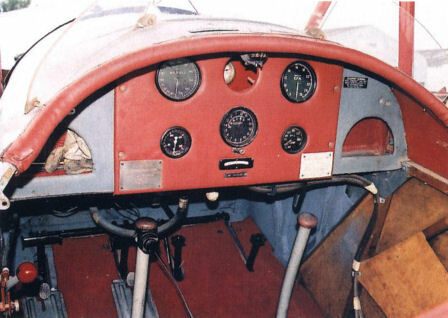 The controls in the cockpit are of normal type, except that a somewhat unusual type of pedal movement is used for the rudder control. With side-by-side seating there is not a great deal of width for foot bars of adequate length, and so Mr. Kenworthy has adopted pedal control, which gives parallel movement, and avoids the angularity that would result from using very short foot bars. The pedals are easily adjustable, so as to suit pilots of various heights, the type of pedal used being shown in a sketch. The Armstrong Siddeley "Genet" engine is mounted on a steel tube structure in the nose of the fuselage. Triangulation is obtained in the top bay by two tubes arranged in a Vee, and in the side by diagonal tubes. Over the main engine mounting structure is a light skeleton, which carries the engine cowling panels. The main petrol tank is mounted in the deck fairing just aft of the fireproof bulkhead. The tank in this position is placed high enough to give direct gravity feed to the engine, and its absence from the top centre-section results in a better appearance, as well as reduced drag. 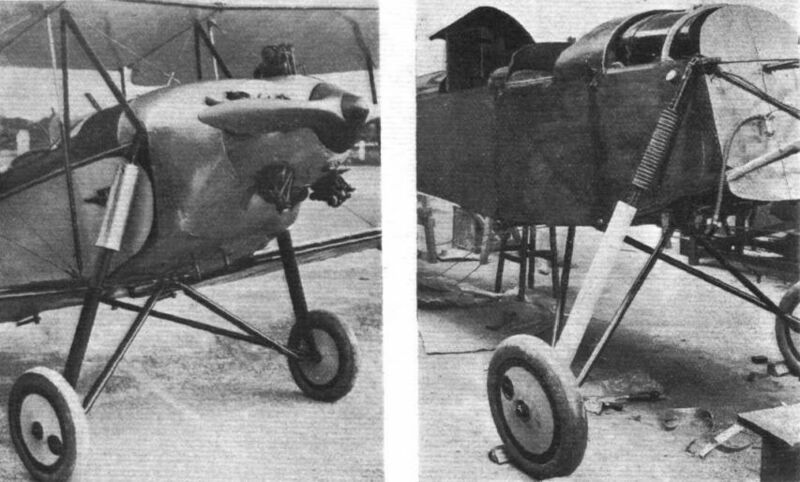 The undercarriage of the "Redwing" is of the "split" type, with the bent axles and radius rods, as already mentioned, hinged to the centre-line of the bottom of the fuselage. The telescopic legs are taken to the top longerons. These legs incorporate oil dampers and compression rubbers. There are no springs or valves, the main loads being taken partly by the oil and partly by the rubber buffers. The legs are double-acting, i.e., the oil exerts a force restraining the legs, when these have reached the top of their travel, from dropping quickly, so that the machine has no tendency to bounce. The stroke of the telescopic legs is fairly long, so that the machine can be landed without damage on even quite rough ground, or by a pilot of no great skill. The tail skid is of Vee type, with the rear member telescopic and containing a coil spring. The skid is steerable, and padded bracket arms limit its travel. A quickly-detachable shoe of large area is fitted, which can easily be renewed when excessive wear has taken place. 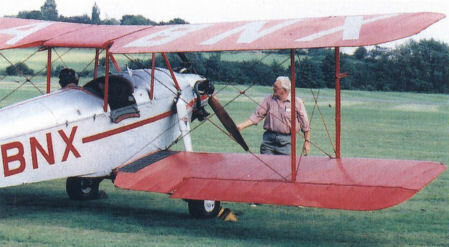 The biplane wings of the "Redwing" are of orthodox construction with box spars having spruce flanges and three-ply webs. 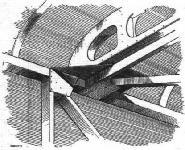 The wing ribs have spruce flanges and braces, joined together by small three-ply gussets, as indicated in a sketch. The interplane struts are streamline steel tubes, and the end fittings are particularly neat, the flat steel plates which joint them to the wing fittings being buried in the strut ends. The same flat steel plates also form the lugs for the incidence wires. The wing-folding arrangement is unusual in that there is a special device which automatically centres the ailerons when the wings are folded. 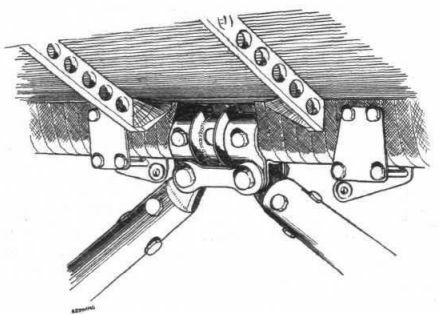 This device, which is shown in a sketch, consists of a T crank mounted on the lower wing root. From the ailerons cables pass to the ends of the crank. The other crank member is joined to a horizontal tube, which connects with the lower end of the pilot's control. The arrangement of the device will be obvious from the sketch. It should be pointed out that ailerons are fitted to the lower wing only. Cables are used in straight lengths only, and do not pass over pulleys. The cockpit of the "Redwing" is, in spite of the fact that no space has been wasted, by no means cramped, and the view from both seats is quite good. A full range of instruments (Smith's) is fitted, including altimeter, air-speed indicator, revolution indicator, oil pressure gauge, oil thermometer, eight-day clock, Simm's petrol gauge, cross level and switches. The "Redwing II" has an overall length of 22 ft. 3 in. (6 780 m ) a wing span of 30 ft. 6 in. (9,3 m.), and a wing area of 250 sq. ft. (23,25 m2). 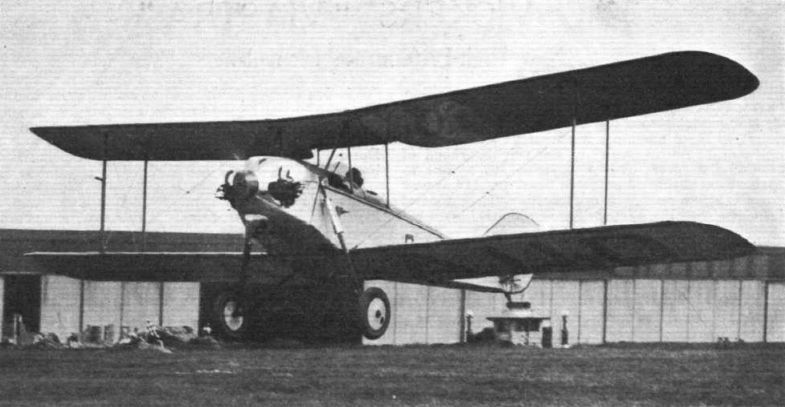 With wings folded the overall width is reduced to 9 ft. 8 in. (2,95). The tare weight is 860 lb. (391 kg. ), and the gross weight 1,450 lb. (650 kg. ), so that the ratio of gross weight to tare weight is 1-686. The maximum speed is approximately 95 m.p.h. (153 km./h. ), and the cruising speed 85 m.p.h. (137 km./h.). The landing speed is very low. The exact figure has not yet been ascertained, but it is probably not much more than 30 m.p.h. (The wing loading is very low: 5-7 lb./sq. ft.). The machine has been designed for easy and safe flying rather than for high performance, and the low landing speed, coupled with good controllability, should make it very suitable not only for instructional work, but also for the private owner who desires a machine which is easy to fly, cheap to run, and of low first cost. The price of the "Redwing" has been fixed provisionally at ?575. 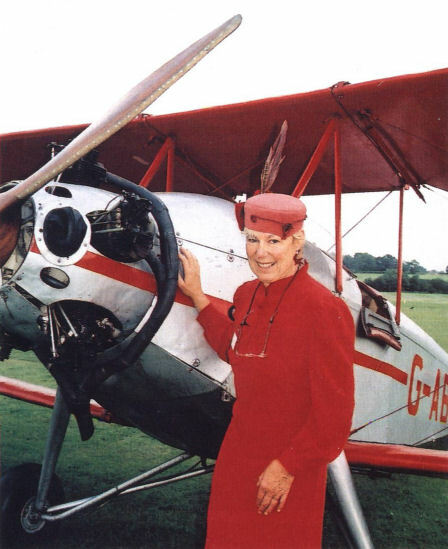 For further information, and for demonstration flights, application should be made to the Robinson Aircraft Co., Ltd., Stafford Road, Croydon, Surrey. 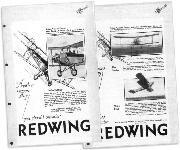 DESIGNED to be really easy to fly, the "Redwing" side-by-side two-seater was designed by Mr. John Kenworthy to incorporate such features as low landing speed, good controllability to enable the slow landing to be made in safety, good stability at all speeds so that the machine should not be fatiguing to fly, and with a wide undercarriage track to ensure stability on the ground and to avoid risk of blowing over in a strong wind. The "Redwing" has been in use by various schools and clubs for a considerable period, and the aims of its designer appear to have been fulfilled. 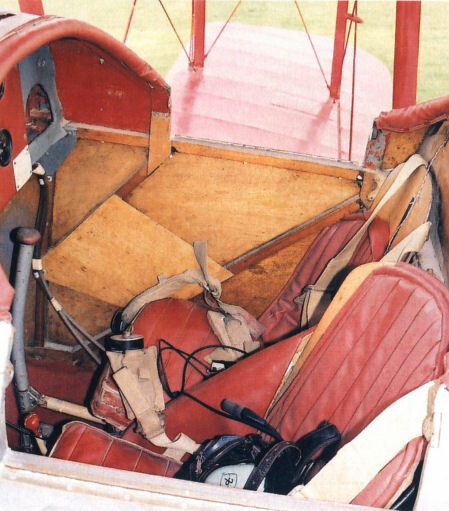 Mr. Kenworthy believes that the side-by-side seating arrangement is the logical one, not only for school work, where the pilot and instructor can converse without the use of telephones, but also for private use, as the side-by-side seating is more sociable. The engine fitted as standard in the "Redwing" is the Armstrong-Siddeley Genet, of 80/88 b.h.p. With this engine the petrol consumption is approximately 5 gall. (22.7 litres) per hr., so that at cruising speed the "Redwing" does approximately 20 miles per gall. (56.5 km./litre) of petrol. The petrol tank has a capacity sufficient for 3 1/4 hr. at a cruising speed of 85 m.p.h. (137 km./h. ), giving a range of about 275 miles (440 km.). The maximum speed of the "Redwing" is 96 m.p.h. (155 km./h. ), and the landing speed reaches the very low figure of 30 m.p.h. (48 km./h.). The "Redwing" has a length of 22 ft. 3 in. (6,8 m.) and a wing span of 30 ft. 6 in. (9,3 m.). The wing area is 250 sq. ft. (23,2 m.2). For a tare weight of 870 lb. (395 kg.) the "Redwing" has a disposable load of 580 lb. (263 kg. ), giving a gross weight of 1,450 lb. (660 kg.). G-ABNX regularly flies from Redhill. G-ABNX taxies out at Redhill. In the right seat is John Pothecary who rebuilt the aircraft. Pilot Nocholas Parkhouse in G-ABNX following a flight at Redhill. G-ABNX is ideally situated at Redhill, the aircraft being very much a part of Surrey's aviation heritage. John Pothecary turns the propeller prior to start-up. Redwing II G-ABNX, the sole survivor of its type, sits out on the grass at Redhill on August 16, 2002, the day the Redwing Preservation Trust was launched. Close-up showing the five-cylinder Genet. The Redwing features an exceptionally wide track undercarriage. Detail shot of the Redwing' sturdy undercarriage. Pippa Martin, daughter of John Lane, is a keen supporter of the Redwing. Members of the Redwing Preservation Trust assembled by G-ABNX at Redhill in August 2002. 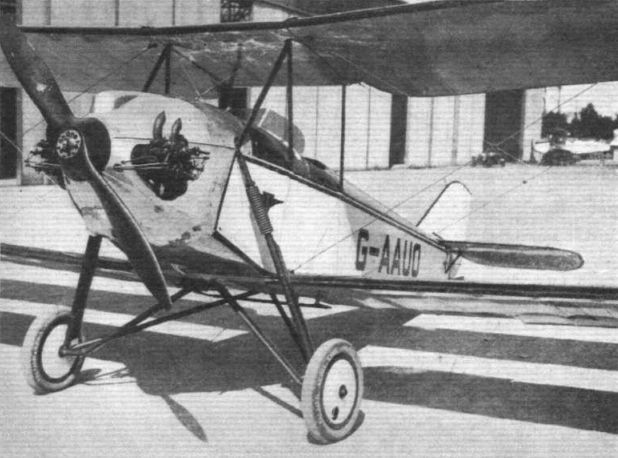 Redwing I G-AAUO fitted with the ABC Hornet engine, which was later replaced with the Genet. THE ROBINSON "REDWING": Designed by Mr. John Kenworthy and built by the Robinson Aircraft Co., Ltd., this machine is a side-by-side two-seater of wood construction. The engine is an A.B.C "Hornet" of 75 h.p. 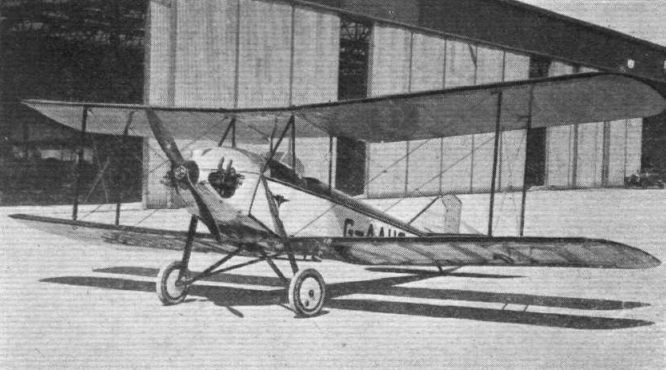 A TWO-SEATER, side-by-side biplane of recent production and of wood construction. Designed for very low landing speed and ease of handling by pilots of only medium skill. The engine is an A.B.C. "Hornet." The "Redwing": This view of the nose gives a good idea of the neat engine cowling, the undercarriage, &c.
GETTING AWAY: With its light wing loading the "Redwing" has a very good take-off and climb. A WINTER CRUISER: The Robinson "Redwing II," which is fitted with Armstrong Siddeley "Genet" engine, recently made a tour of about 1,000 miles to various towns in England. The machine is here seen at an altitude of 5,000 ft. above the clouds. 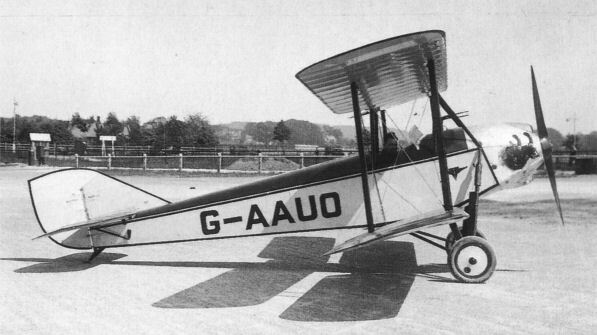 G-ABDO was the prototype of this mark of this side-by-side two-seat biplane, designed by John Kenworthy and built by the Robinson Aircraft Co Ltd, founded at Croydon, surrey, by Capt P.G. Robinson. 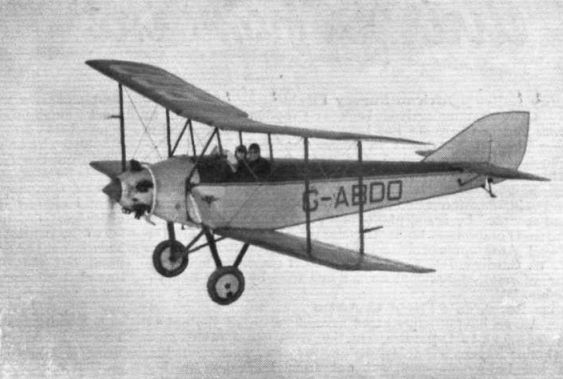 First flown in October 1930, ’BDO was powered by an 80 h.p. Armstrong siddeley Genet IIA air-cooled radial engine. 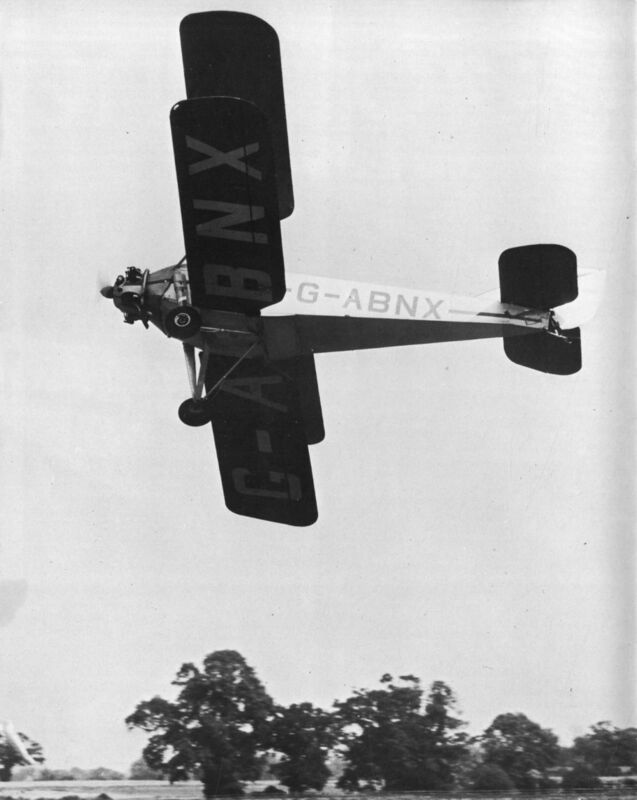 It was used by the newly formed London General Omnibus Company Flying Club, based at Broxbourne, hertfordshire, and the manufacturer’s test pilot, Flt Lt N.M.s. Russell, became the club’s first instructor. Granted its C of A on December 6, 1930, it passed to Miss E.R. Gerrans at Maylands, Romford, essex, in August 1934, but in July 1937 was damaged in a hangar fire at Gravesend in Kent. The Redwing being flown by Flight-Lieut. Russell, who is the Robinson Aircraft Co.'s chief pilot. The clean lines of the fuselage should be noted. John Pothecary’s unique Robinson Redwing II during an appearance at Old Warden earlier this year. THE ROBINSON "REDWING MARK II": This side view shows that the lines of the fuselage are good, in spite of the side-by-side seating. Note the unusual shape of the rudder, which gives the machine a distinctive appearance. 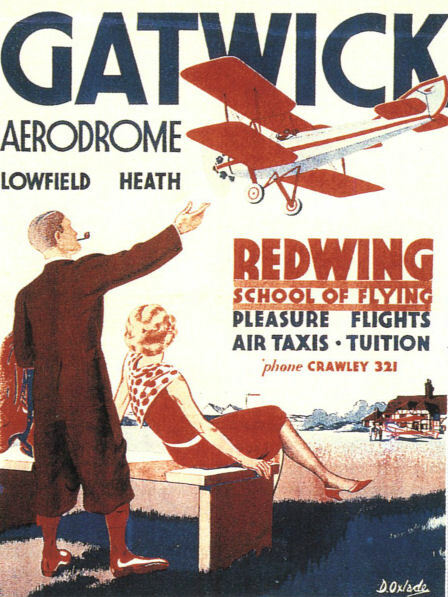 COLCHESTER: The Blue Barns Aerodrome at Colchester is now the sales depot of the Redwing Aircraft Co., Ltd., for all territory north of London. Here is shown a group of Redwings when the depot was opened by Flt.-Lt. Russell. The Christening Ceremony: Air Vice-Marshal Sir Sefton Brancker, Director of Civil Aviation, "unveils" the name "Redwing." The Power Plant: Mr. Dennis (right) pointing out to Lord Ridley (Chairman of A.B.C. Motors) the neat cowling of the A.B.G. "Hornet" on the "Redwing". On the left is Mr. Elliott, who designed the "Hornet." Side-by-side seating arrangement in G-ABNX. A large luggage locker, with rearward extens on for golf clubs, is a feature of the "Redwing." 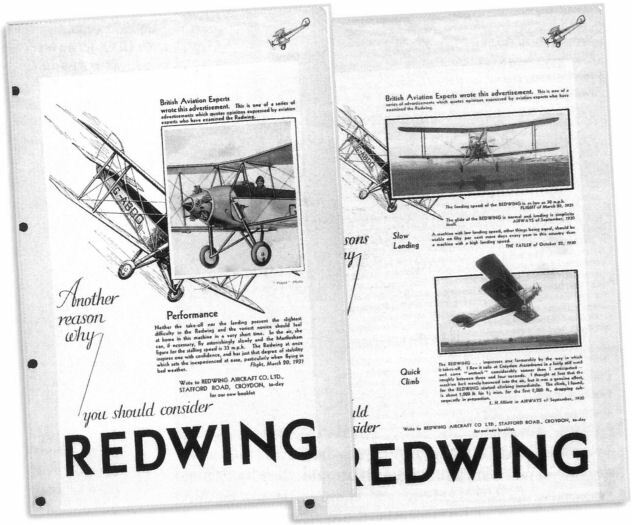 Two advertisements promoting the Redwing's pilot-friendly flight characteristics.